Can you be a greenie and a fashion lover at the same time? I hope I'm living proof that you can, and with labels like One Teaspoon it's getting easier all the time. The other day I dragged myself to the OT sample sale to score something from their Salvage range to refresh my summer wardrobe. My eco-fashion curiosity had been piqued recently when I heard about OT's line of upcycled denim, so when Missy Confidential alerted me to the warehouse sale I jumped at the chance to get some Salvage at a discount. The things I do in the name of research. The very chic, very clever folks at OT scour the globe for pre-loved jeans (only 1 in 8 pair make it through the strict quality tests) then pull them apart and re-stitch them into the hottest shorts, jeans and minis on the market. 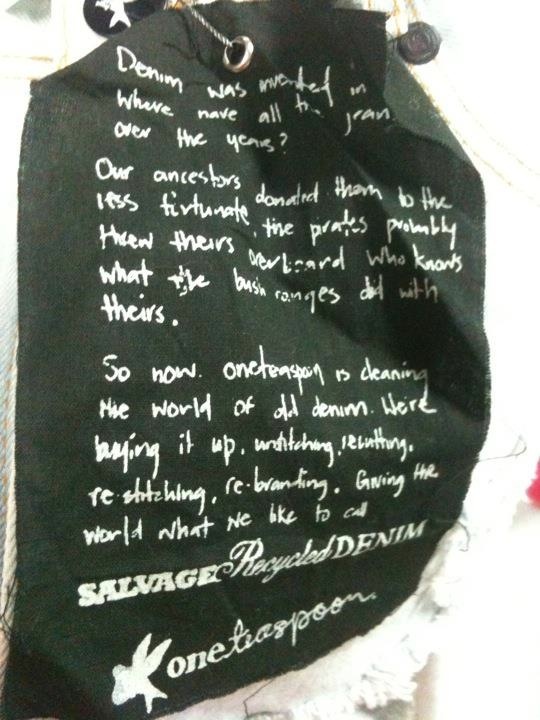 No additional colour or chemical treatments are made to the denim, only the occasional distressing or detailing. And though each piece is truly one-of-a-kind they are all totally One Teaspoon (read: extremely covetable). The colours and detailing all vary because of their pre-loved nature. I hot-footed it to opening day of the sale and less than two hours after the doors opened the place was already buzzing. Scores of the Northern Beaches most stylish were hunting through racks of denim, maxi dresses, knits, swimsuits and tees, feverishly seeking out the best fashion bargains. I couldn't help but feel overcome with nostalgia for simpler days when my only warehouse sale concern was whether I'd find my size, and had to remind myself that just because the prices were amazingly low didn't mean I could buy whatever I wanted (and yes, I wanted); I was here for recycled denim only. These large black tags hung from each Salvage item helped focus my attention. I found a selection of Salvage shorts and skirts in my size and worked my way into the crowded group changing area. I stayed strong and walked out with only one pair of Salvage shorts - after waiting in a queue twenty people deep - excited that my purchase left both the environment and my wardrobe better off. All in all I had fun revisiting the scene of many fond fashion memories. Though my resilience was strongly tested, it was fantastic to be shopping amongst my fellow fashion-lovers and find eco-fashion by a mainstream label. I only hope more labels take OT's lead and create upcycled, recycled and eco-fabric fashion so we can all (easily) be eco-fashionistas. still really good motivation to keep up my yoga!